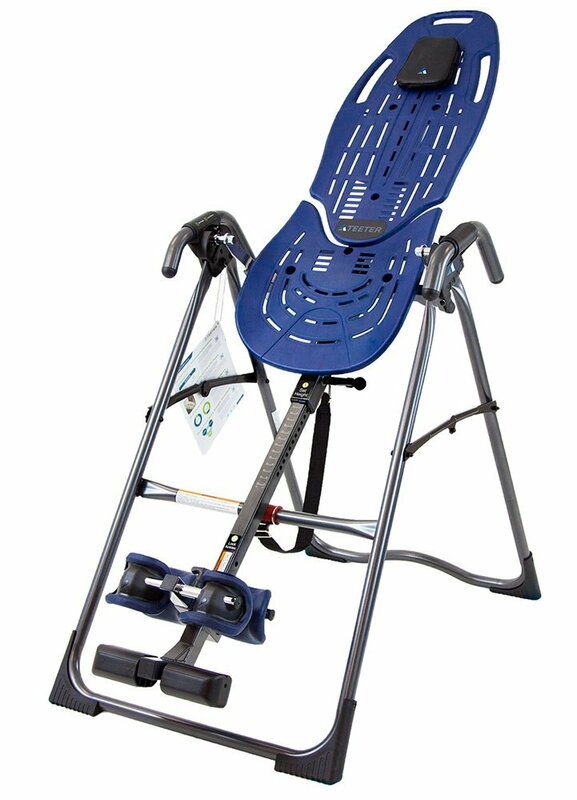 The Teeter Hangs Up EP-560 inversion table is the one of most popular choices for customers considering the proven Teeter line’s ComfortTrak series. Teeter is a trusted company with its commitment to quality is inarguably the market leader in inversion tables. The company was created in the 1980s by Roger Teeter and his wife Jenny, and the idea was to manufacture and sell quality inversion products that would also help them (especially him) find relief from chronic back pain. Now, they’re both over 70 years and they credit their active lifestyles to the Teeter Hang Ups that they continue to use daily. With the Teeter Hangs Up EP-560, Teeter delivers the same high quality product it is widely known for, and it is sure to give you value for your money. Comparing the EP-560 and similar models in the same Teeter range to other inversion tables on the market that may seem cheaper or appear to do the same thing, you realize that looks are deceiving. Teeter inversion tables such as the Hangs Up EP-50 are fitted with several specialized features that distinguish them from the competition. Teeter inversion tables are known for their key design features. The EP-560 is no exception, and is fitted with advanced technology that is built to last with superior components. · Dimensions: The inversion table has non-use dimensions of 60” x 58.5” and while in use, it measures 84” x 28.8” x 86”. The unit weighs about 60lbs when assembled. · Maximum Capacity: It is able to support a user weight of up to 300lbs(136kg), and permit users of height of between 4’8” (1.42m) and 6’6” (1.98m) to use with ease. · Durability: It features a heavy-duty carbon steel base that allows for a raised grip that enhances stretching, corner feet that increase the width of the base and protect your floors and a shiny, scratch-resistant finish for an attractive appearance. · Ankle Support: The machine is fitted with special Ergo-Embrace™ foam ankle locks that assist in pressure-reduction. It also has a comfort dial that is curved to fit securely around your ankles and help keep ankle pressure low during inversion. The comfort dial platform lets you dial up or down depending on your ankle size. · Smooth Surface: The EP-560’s smooth, durable plastic surface reduces the friction created during inversion and improves decompression and comfortable flexes during the user’s stretching and exercise motions. The Teeter Hang Ups EP-560 can be put up in a few minutes with the system arriving mostly pre-assembled. It is a quick and simple process to follow the owner’s manual it comes with and assemble your machine. · Adjustable Head Pillow: This is a common feature across most Teeter inversion tables. The removable head pillow can easily be moved and adjusted to suit the user’s comfort needs. · Extended Handles: The stretch assist handles in the EP-560 provide a large grip surface allowing the user a more secure hold on the unit. It also features an embossed angle guide for safe inversion.
. Rotation Control: Also found in the EP-550, this pre-set feature with its adjustable tether will let the user pre-determine the maximum angle of inversion for safety. You can either set the maximum inversion angle or remove it to enjoy full inversion.
. Fully Customizable: Several customizable features such as the EZ-Up Gravity Boots and EZ- Stretch Traction Handles are available for purchase separately to upgrade the user’s experience with the EP-560. In addition to its key design and safety features, the Teeter Hangs Up EP-560 comes with some upgrades not present in other inversion tables in this range. · ComfortTrak™ Bed: Rather than memory foam or other padding, the EP-560 has a bed designed with toughened plastic. The patented bed adjusts to suit any body shape. Its innovative bed design was also built to accommodate Teeter’s most popular accessories for a customized, unmatched support and comfort support experience. · Safety strap system: The strap system Teeter provides with the EP-560 is adjustable and can be used to restrict the inversion angle. Teeter offers one of the best and lengthiest warranty coverages for inversion tables in the industry, with its 5-year full warranty on purchase. Buying the Teeter Hang Ups EP-560 is buying with confidence that you will receive extensive support for any defects or malfunctioning you experience with your machine over the years. So what should you consider precisely in choosing an inversion table that suits your needs? Based on customer reviews, a properly evaluated list of what’s great and not-so-great about the EP-560. · At 60lbs, the EP-560 is a slightly heavier unit than some other leading inversion tables · It also lacks the advanced locking system/flex technology that some Teeter models such as the EP-960 and other competitors like Ironman have incorporated in design. This means users with severe back pain would have difficulty locking and releasing their ankles. There is no doubt Teeter is an industry leader that has been providing top quality inversion tables since its inception. The Teeter Hangs Up EP-560 is an improvement on earlier EP-550 model and is of same, durable Teeter quality. From reviews, it has been proven to offer many customers great results. At an affordable price, the unit provides what many users look for in a good inversion table and should be a top consideration for anyone in the market for inversion tables today.